Czech Republic: Právo na e-ctení, vaše knihovna: legalizujme to! Denmark: Lige adgang! Adgang for alle! France: Lecture numérique en bibliothèque: légalisez-la ! Germany: E-Medien in der Bibliothek - mein gutes Recht! Italy: Lettura digitale in biblioteca: legalizziamola! Montenegro: Pokloni je! Pravo na citanje e-knjiga Vaša Biblioteka! Portugal: Ebooks nas bibliotecas: Um direito! Sweden: Grant it! Enact it! Who can use the campaign materials? EBLIDA (EGCIS) comments on Creative Europe.
" Does it still make sense that a European library cannot lend a book to someone just because he or she happens to be across a border?" said Commissioner Barnier at the launch event of the CEPS Digital Forum. Can e-lending land itself a spot under the public lending right? In the Name of the Right to Oblivion, What will be left of Europe's Future Heritage? Funding for Creative Europe needs your action! Say NO to the closure of Greek Public Libraries! EBLIDA Newsletter October 2013 published! Today is the day - The Right to E-Read Day! EU Parliament Breakfast discusses the role played by libraries in the European Union of improving access to information and knowledge in the digital era. What are Dutch libraries doing for refugees? 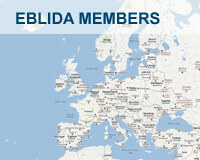 Thanks to all for making the 24th EBLIDA Annual Council Meeting & EBLIDA-NAPLE Conference a Success! EBLIDA’s answer to European Commission Public Consultation on Publishers’ Role in the Copyright Value Chain and Freedom of Panorama exception. BLOG POST: Why we need transparency? How can the EU make a balanced copyright framework for the DSM? Sofia Declaration "Europe needs its Libraries - Heritage and Knowledge for a Stronger EU"
Open letter "The EU Copyright Directive is failing"